Shopback Has Extended Singles Day 11.11! Hi, dear readers! Yesterday was an exciting event! A lot of my friends and even yours truly did not sleep at midnight. We had all waited for the start of the 11.11 Online Revolution! With a click, everyone was so busy online looking for items with a bigger discount. Buy 3 get 1 Free/ Everything at 999, Buy 2 for P1,699. 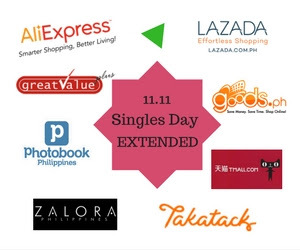 Standard terms and conditions of ShopBack, Lazada, Althea and Great Value Plus apply, and the parties reserve the right to amend / append / withdraw the terms and conditions without prior notice.